Researchers identify protein that protects heart function into old age. The human heart makes precious few new cells but manages to generate billions of life-sustaining beats as it grows old. Now research conducted in fruit flies, rats and monkeys by researchers at Johns Hopkins University, San Diego State University, Cedars-Sinai Medical Center, the National Institute on Aging and Sanford-Burnham reveals that levels of a protein called vinculin increase with age to alter the shape and performance of cardiac muscle cells, a healthy adaptive change that helps sustain heart muscle vitality over many decades. The team state that the findings reveal that vinculin fuels beneficial structural and physiologic changes in aging heart cells, and it can be an important therapeutic target to slow down the heart muscle’s inevitable demise. They go on to add that the new findings about the role of vinculin could pave the way to treatments that extend the lives of patients afflicted by heart failure, largely a disease of aging marked by heart enlargement and weak pumping. It is estimated to affect more than 8 million people in the United States alone over the next decade. The current study showed rising vinculin levels in the aging hearts of multiple species. The protein’s presence in organisms of various physiologic complexity, the researchers say, is a sure sign of its conservation among species and its evolutionary importance. The researchers analyzed levels of vinculin in the heart muscle of adult and aging fruit flies, rats and monkeys. In all three, vinculin levels rose steadily with age. Next, the team analyzed biopsies from rat hearts. Compared with cardiac cells obtained from younger rats, tissue from old animals showed notable clustering of vinculin in the cell junctions, the bridges that connect one cell to the next, a pattern the team also observed in fruit flies. The researchers hypothesize that the pattern allows vinculin to boost transmission of mechanical force from cell to cell and enhance overall heart contraction. To figure out exactly how vinculin helps maintain heart function into old age, the current study focused on fruit flies because of the insects’ well-known genetics, rapid aging and short lives, which facilitated the study of vinculin-driven changes over the span of a lifetime more quickly and efficiently. They compared several strains of flies, including a strain with normally functioning vinculin genes and one naturally deficient in vinculin. The data findings showed that the cardiac cells of flies with normal vinculin accumulation got smaller with age and showed the characteristic vinculin clustering around the periphery of the cell and along the intercellular bridges. When researchers induced genes in vinculin-deficient flies to crank out more of the protein, their heart cells quickly shrank in size and developed the same distinctive vinculin clustering around the border seen in cells obtained from their cousins with normal vinculin genes. To gauge whether these cell changes led to difference in cardiac function, the team performed something akin to a human heart stress test. They immersed the insects’ isolated beating hearts into a thick solution, forcing them to work harder than they normally would. The hearts of flies with normal vinculin tolerated exertion much better than the hearts of vinculin-deficient flies. So did the hearts of the once vinculin-deficient flies that the researchers had genetically altered to produce more of the protein. In a final step, the researchers studied the interior of heart cells. The team state that what they noticed suggested how and why vinculin caused changes in cardiac performance. Cells encircled by vinculin had a markedly well-organized interior, their contraction-fueling muscle proteins in a near-perfect arrangement. By contrast, muscle proteins inside heart cells from vinculin-deficient flies had a decidedly more disordered pattern of arrangement. An exquisite visual proof of the principle that form dictates function. Encircling the cell like a rubber band, vinculin appears to keep its interior impeccably arranged and in doing so ensures that form and performance remain intact. Most strikingly, however, flies whose genes were induced to precision-boost vinculin production only in the heart, sparing other organs, survived, on average, 150 percent longer than their vinculin-deficient counterparts. Previous studies show that as the heart ages, subtle molecular shifts can affect cell growth, behaviour and the function of key proteins. All of these changes, over time, alter the heart’s ability to pump and contract. Past research has focused on the mechanisms that erode heart function. In contrast, the present study aimed to pinpoint how changes in protein function actually preserve cardiac strength. The team surmise that vinculin appears to be at the heart of a natural defense mechanism that reinforces the aging heart cell and helps it better sense and respond to age-related changes. They go to conclude that capitalizing on the body’s own protective mechanisms and hijacking them therapeutically could help halt the decline of organs that don’t regenerate. Arp2/3 complex and vinculin in filopodia. 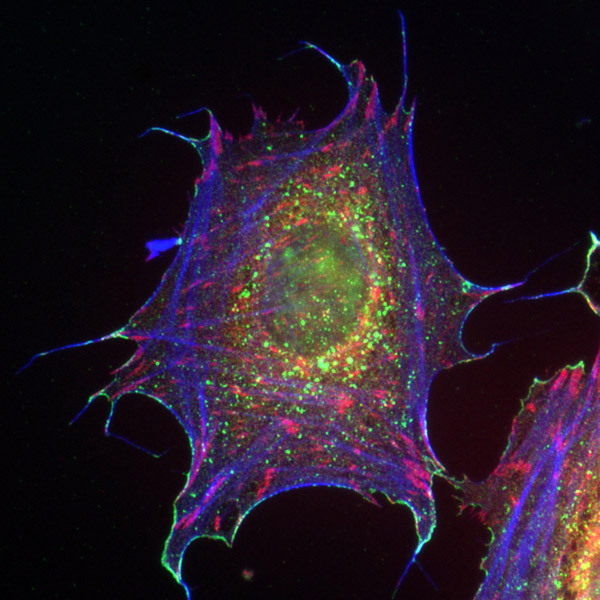 After attachment to a fibronectin substrate, mouse embryonic fibroblasts produce filopodia, and staining for the actin-related Arp2/3 complex (green) and the focal-adhesion protein vinculin (red) showed numerous focal adhesions but little co-localization. Actin (blue) was labeled with rhodamine phalloidin, vinculin with a vinculin antibody and the Arp2/3 complex with an antibody to the p34-Arc subunit. Taken from: Laura Machesky et al., 2008, BMC Cell Biology.